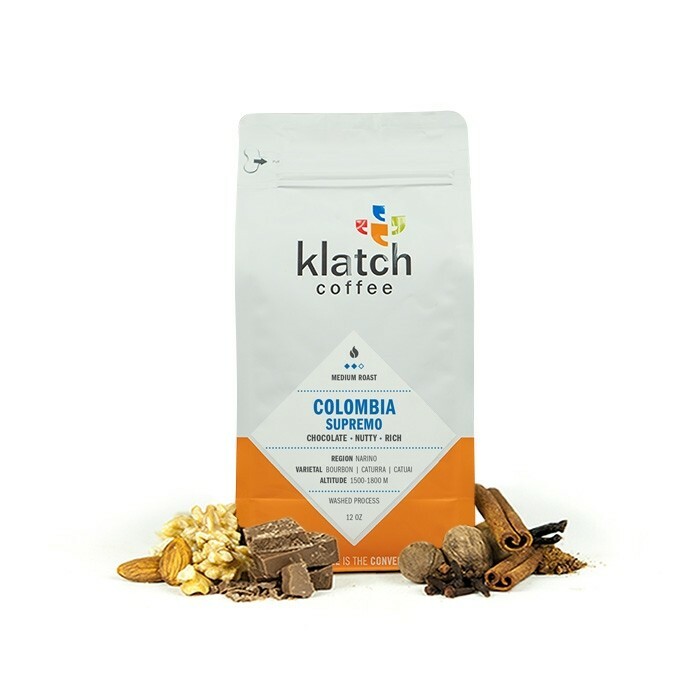 This is the Colombia Supremo brought to you by Klatch Coffee. This fully washed coffee was grown by the various small holder producers in the Nariño region of Colombia between 1,500 - 1,800 meters above sea level. The cup is comforting and familiar, with notes of rich chocolate and roasted nuts and a full, round body. Better than the light roast, not as good as the Honduras Las Capucas. Pretty decent, but nothing extraordinary. It was ok but not my favorite. This is quite bitter, almost harsh - the first Mistobox that I have not enjoyed. Excellent coffee for French Press. Medium to full bodied, bold but not overpowering, clean and not bitter. Rich like chocolate. One of my all time favorite french-press roasts. Absolutely love the nutty caramel taste - powers through every sip! Excellent flavor and very smooth. Rich and smooth with an excellent flavor. It also has a great resealable package. We will definitely be ordering from them again. Bright enough for your acidy loving cohabitating partner, but rich, dark, chocolatey, nutty, and smoky enough for morning comfort. Very smooth drinking. Really enjoyed this one, and thought the roast was a good level for us. Might have liked more acidity, but otherwise a great coffee. Nothing really stood out on this one. Boring, flat and muddy. Like dirt and chocolate mixed together not in a great way. No nuttiness to be seen. Good flavors, good strength, very solid. Slightly bitter flavor. Ok with cream and sugar. Not spectacular. On the bitter side, not to my preference. Quite tasty. Bold without being harsh. Accurate description on this one. Great coffee and loved the notes. This roaat was a bit too mild for me, but still nice. This was good. Very flavorful. This batch of Columbia Supremo seems to possibly be over-roasted by the coffee roasters. This coffee mostly tastes burnt and bitter overall. I've tried a number of different water temperatures, grind settings, and brew methods and none of which seems to alleviate the heavy bitterness of the coffee. I haven't really experienced the expected tasting notes either for this coffee. Good flavors, chocolate, smoke, honey, clove, cinnamon. The nuttiness is more prominent than my preferred level (although I've tasted others that are much too nutty vs this one). Chocolate notes, overall smooth. It's a 'good' coffee, just not one I'd go looking to purchase. A coffee everyone could agree upon. Excellent, full-bodied, love all the flavors. Slightly over-Roasted for my taste. Smelled a lot better than it tasted. Could really smell the chocolate and nuts, but the taste was quite bitter. Not as much flavor behind it though to cut the bitterness. The coffee smelled great and looked well roasted with nothing wrong. However when trying the beans raw they tasted like gasoline. Super strong bitter acidic flavor that didn't taste like coffee. When brewed the same flavor came through. There still were the undertones of how the coffee was supposed to taste but it was like something else got into the bag. Enjoyed the coffee very much. The flavors are rich with dark chocolate and nutty flavors, as the package description mentioned. I even got hints of tobacco or dry leaf notes. Overall, the coffee is very good, pretty close to marking it excellent. I would give it 4 1/2 stars! I noticed that my grind was not where it needed to be; so I made an adjustment to my grinder and now the acidity of the coffee is where I like it! A well rounded cup. Rich and full yet light. I enjoyed the chocolate notes but felt the nutty portion was ever so slight. I'm new to Mistobox and haven't tried many different coffees yet. But this was excellent. I enjoy something different each month. I do not enjoy this one at all, the earthy tones are overwhelming. This is basically our ideal coffee. Chocolatey, Nutty, amazing. It was good. A little mild for my taste, but overall had a nice bold punch to it. It's good, but nothing that special. The beans had a very pleasant roasty aroma. I brewed this coffee with the pour over method using a slightly coarser grind than usual. I enjoyed this coffee both black and with sugar and milk. It was very smooth, and the nutty flavor felt comforting and familiar. A nice easy-morning coffee. This struck me as very standard. Didn't love it, didn't hate it. Although, I've heard good things about Klatch, and I'm sure this roast isn't a reflection of the company as a whole, I was underwhelmed. The coffee tasted heavy, dark and very standard. Nothing was pleasant about the cup. This is a very good cup of coffee, simple and smooth. I think I prefer a more complex cup, but that being said this coffee did not disappoint! Best prepared in French Press. This was not bad. The roast was a little burnt. It would have been better if there were some sweeter tones to it to counter the dark burnt earthyness of this. I like the general flavor profile but find the bean lacks the complexity of the previous bag. I think that the cherry notes of the previous bag were something missing here that i didnt think I would want as much as I do. Overall good quality product but i preferred something more interesting. This coffee is decent, but nothing special. You should note that I have never really liked Colombian coffee. My wife thinks it's pretty good. I have tried adjusting my brew method with the Aeropress to try to catch more notes/flavor (grind size, water temperature, brew time, water/coffee ratio), but I still think this is a pretty simple cup. I prefer a more complex cup with more interesting flavor profiles (fruity, sweet, etc.). not much flavor in this one. A good Columbia Supremo by a good roaster. I would like to try something new though. I like this one. I would still be interested in trying something different. I was able to pick up all of the coffee notes this time. The rich chocolate and roasted nuts were excellent when paired with some very dark chocolate we had from Trader Joes. I have never tried to pair a food with coffee like this before but it was amazing. It was a very clean cup of coffee and we moved our grind to see if it made a difference and it did. The last coffee bean we tried was sour and I moved the Virtuoso grinder from a 28 to a 32 and it tasted better and removed the sour taste. Our first cup of this coffee was at a 32 grind and was very nutty but it wasn't until we moved it back to a 28 where I picked up the chocolate in abundance. We are really enjoying this bean and more so than the last Colombian bean we had. Something about the aftertaste was off to me. It’s the same kind of bitter that dark chocolate has, which I also don’t like. Not my favorite. The dark chocolate notes makes it more like a dark roast than a medium. Overall it’s good once I adjusted my grind setting. Nice flavor profile but a little bland/thin when brewed via our espresso machine. Can we try a recommended espresso blend for our next? Nothing special about this coffee to me. It is very smooth however. Just prefer something more complex. I just did not like this coffee. I tried to many different variations on brewing, then with and without cream and sugar. I just didn't like this coffee. It was very mentality testing, watery regardless of how much coffee I​ brewed. Enjoyed the obvious chocolate notes here. Overall, we typically enjoy beans that produce a more complex flavor, but this was still well done and made for a nice cup nonetheless. I just wasn't a big fan of the flavor of this one. I didn't really taste the chocolate notes and I'm not sure I would describe it as rich. I wish I enjoyed this one more. Liked this one a lot! It was nice and rich and dark enough. Made a good espresso too! This one just didn't do it for me. The taste profile seemed flat. Definitely more on track with this coffee. It did have a great Bold Nutty and Rich flavor to it. We enjoyed it. Great consistent tasting cup of coffee. The deep nutty flavor really pops. I tested it out on several brew methods. Everyone of them gave me a good cup but I really enjoyed this one on the French Press. I got the full package experience on it. I normally don't like Colombia but Klatch Coffee has made me a fan. Thank you! The initial sip is acidic and sour, but it smooths out as I drank it. I like the nutty taste. The roast level is good. Little underwhelming. This roast had a pleasant nutty after taste and went down pretty smooth, but those are really the only defining characteristics. I think I might prefer to try a lighter roast. Something with a more complex profile. I recently had Dark Horse's Kenya AA from Baragwi Guama (http://www.darkhorsecoffeeroasters.com/shop/rwanda-nyamasheke-1-lb-z5jn9), and that hit the mark for me. Something similar to that would be great. Coffee was very good! Sweet, nutty, and a smooth finish. I thought it was well balanced and did not leave any bitter or foul aftertastes. Solid cup of coffee. Strong toasted nut flavor with chocolate backing. I would like to modify my previous comments. After diluting the coffee, it turns to be more smooth and not that bitter any more. Good and solid. Comforting and familiar are good descriptors. This is enjoyable but does not stand out. It was okay, seemed to lose freshness more quickly than other coffees. I love the chocolate notes in this coffee, but it's very very acidic. I've brewed it at a few different strengths and found this didn't change. If this coffee were smoother, it would be absolutely perfect for me. I can't give half-star ratings, but if I could I would rate this a 3.5 because of the acidity. Update: Tried this as espresso and it's DELICIOUS. I'll only use it for espresso in the future because it's fabulous. Was okay...just think I prefer light roast, I just changed my personal settings. Was too strong/rich tasting. Our favorite so far, goes great with our expresso machine at a grind of 2. Loved this one, favorite so far. I especially appreciated the way it was packaged: the bag was vacuum-sealed. Quite unusual flavor and smell. I think it might be nicer in a Chemex potentially (using French Press at the mo). Balanced. Tasty...didn’t get a lot of tasting notes and didn’t seem as rich as some other coffees I like. Very mellow and good to drink. Excellent, though I wish it had a bit more sweetness or caramel in addition to the chocolate. I'm thinking I may like coffees with more fruit flavors. I had Intelligencia recently and really liked it. whoops have not yet received this one. Would still like something more complex and sweeter, more vanilla less nutty. This one was pretty solid. flavor wasn’t as rich as I was originally anticipating but the chocolate tones were tasty. Standard-good. I liked previous bag better. Maybe I like chocolate/caramel more than nutty which wasn't what I thought I liked. Looking forward to the next bag! It was alright. Not as good as the Brazil Canarinho. I know this one was enjoyable. But honestly don't remember it enough to note. I liked the chocolate/nutty taste a lot on this one. This one happened to be too dark for me. I'm sure it has to do with my brew method, but it is coming out more bitter than other coffees I brew. Too roasty with an almost cigarette mouth aftertaste. really nice flavor and balance. Love it! One of my favorites so far! Excellent as french press for manual brew. Not very acidic, which I love! I really loved the smell/aroma. The strength in the bean was great. I didn't have to worry about adding too much or too little, it always tasted perfect. This is my favorite one I've had in my shipments so far. Maybe I just like them more with chocolate/nuts than with the more fruity overtones, but this one's just delicious for me. Chocolates and nutty with body, just as it says. Took a bit of adjusting brew method and grind to mellow out the acidity. My husband thought this was too acidic. Enjoyed this batch coffee more than the previous, but still getting a little bit of a bitter taste, or perhaps it is the nutty flavors? The beans smelled great and the coffee was drinkable, but not as enjoyable as the first batch we received. Still trying to find its sweet spot on the espresso machine, but so far have received some bitter notes with earthy undertones. Haven't been a huge fan of south american coffees. Nothing special. Garden variety coffee. Little too bitter for my tastes. Not very rich. nice and mild. i enjoyed it. Quality of these beans were very inconsistent with different brew methods. A little too rich. Enjoyable cup. Mild and full bodied. When I opened the bag I was a little surprised that my beans looked dry only because I haven’t had good experiences with these type, I usually go for the oily looking beans but I was surprised after I got my French press going it was strong, but smooth and definitely chocolate flavors. I enjoyed my cup of coffee. Definitely nutty, perhaps too nutty. I could not brew a cup without that being the dominating taste which neither my wife or I cared for all that much. It wasn't bad, but it wasn't our favorite either especially compared to previous coffees. The aroma was indeed familiar and pleasant however. Incredibly smooth! Definitely want to try some more Klatch in the future. 1) I enjoyed this less than my first coffee. 4) It is smooth, thick, but missing vibrancy. 5) For my next coffee, I would prefer something more vibrant with more fruit sweetness. I really enjoyed this coffee. Even more than the first bag I received. I enjoyed the richness of this one. It had great flavor without being too bold. Very tasty. We liked the smooth chocolate taste that came through with our French press. It is hard to explain why, but we felt it didn't deserve 5 stars. The first coffee we had continues to be our favorite. While good, I didn't find the coffee hit the notes as described and was more roasted than expected. I liked these beans less than the Brazil Canarinho. It was smooth and balanced, but too bold for me. I'd call this a solid 'comfort coffee', by which I mean a good solid cup without being too 'fancy'. I found it really well balanced and enjoyed the nutty taste which wasn't at all overwhelming. Truth be told, I wish it were just a bit darker or stronger, but I definitely enjoyed this one and would easily order it again. It's only the third in my collection but also the first I would put on my 'reorder' list! A little too light for me. We loved this coffee. The rich and nutty flavors definitely came through. Really well balanced without overwhelming. Really amazing coffee with each brew - our favorite so far! Tasted chocolate right away. Great flavor and aroma. Good in both a french press and Chemex. Chocolate is the dominant flavor. I prefer a little more complexity of flavor, but I would consider getting this one again. Great coffee. I shared it with friends but didn't want to because I wanted it all for myself. Much love. Awesome, fits its description well. Definitely my favorite so far. I was surprised that I liked the flavor as I don't normally enjoy Klatch coffees. This coffee was good. Rich and nutty. This was a great espresso. Very rich and chocolately. Perhaps a little too chocolatey, but if you're into that, this is the blend for you. Its a good coffee. For tasting notes, I do taste the nuttiness, maybe a little chocolate, and it does have good body. And I said I don't like Columbian. But this is divine. Of the beans received so far, this one was my least favorite. It was a little too full / rich of a coffee. The quality was great, but wasn't my cup of tea (coffee). don't know if I got a bad batch, but I never got a good brew with these beans. Sour. It lacked the acidity of the others and still had a bold enough flavor. I've been a fan of Klatch since before I joined Mistobox. But, while this might have been a great variety, it was over-roasted to the point of being undrinkable. Tended to have astringency and some bitterness even after lowering extraction time from previous beans. Seemed to be on the darker side, which I'm less of a fan of. This coffee is my jam right now. I'm digging that nutty taste. Decent, but a bit weak. It could have used with a bit more roasting, so the flavors were a bit too subdued. Lighter than my last coffee but a nice balanced flavor. The last was a bit too rich in flavor this one maybe a touch too light. Somewhere in the middle would be perfect. Made using my Chemex method, 28grams of coffee, 205 degree water, 360 grams of water, 4 min 30 mins brew time. Great flavor and the description of the flavor notes are spot on. Not my favorite. I don't like the aftertaste. At least with Chemex. Maybe it would be better with french press. Bad and burnt. Tastes way cheaper than it is. Do not recommend. Delicious! Perfect. Rich and creamy. Right up my alley. These are all my favorite notes combined in one cup. Awesome awesome awesome! Really enjoyed this one. Nutty and chocolaty with a consistent breadth of notes. The background flavors are nice, but overall it is too acidic for my taste. While this is my fault for not having rated my last coffees, this roast was way too dark for me and with strong cherry notes - my least favorite flavor. Resolved to drink it diluted in my Chemex, which is a shame as I’m drinking the coffee for caffeine and heat and not at all for flavor. One of my favorites. Beautiful, balanced, and rich chocolate with a refreshing juiciness. Comfortable like a blend,but with character notable as a single origin should be. This one would become a regular at our house. Felt like a very comfortable coffee. Went quickly and was enjoyed. I'd like a little more fruit maybe, but the chocolate was great. I found it difficult to brew anything but a weak cup. I adjusted how I ground the beans and even tried using a French press, but I could never get a lot of flavor out of this coffee. It was okay, but not vey flavorful. THIS. This is the perfect coffee. Not as smooth as I like. Loved this coffee! For those that love a chocolatey and nutty coffee that isn't too dark, this will be a treat! Disliked bitter flavor and chocolate notes. Consider this the Honda Civic of all the coffees i've tried. Nothing offensive about it, pretty reliable, and very forgiving of inconsistent/inattentive brewing. Great selection, smooth, delicious, not bitter or over roasted. Thanks for this choice. This is a fabulous coffee! It always brewed a good cup. It had a rich, bold, flavorful taste from start to finish. It was strong, but not overpowering. We were sorry when the bag was empty. Nice bold taste, without being overly bitter. Compared to the La Colombe and 1000 Faces, this just wasn't as balanced. I honestly think there's only so far you can go with 100% Columbian. Pretty good, but from the reviews on the side of the bag I though it was going to blow my mind. It was a solid cup of coffee in both my drip pot and my french press. I was somewhat disappointed with this cup. It plows right into a strong nuttiness, perhaps almonds and walnuts, that dances around some bittersweet and darker chocolate notes. However, there is a residual bitterness akin to that "dark roast taste", minimal acidity and the cup seemed to fall flat overall. First cup was pretty good balanced cup maybe a tad roasty. Beans Smelled good. Felt like a pretty normal cup of coffee kind of boring overall but still tasted good. This is my least favorite of the 4 coffees I have tried here. I prefer a smoother coffee. This tends to be slightly on the bitter side. I have had Klatch before in southern California. Sadly I was recommend to go there by someone I trusted, and it still really disappointed. I would say it was probably better than something big box in the area, but this roast was just nuked/over roasted. Will try and salvage by turning into cold brew. This flavor is phenomenal when mixed with some dark chocolate and milk. Highly recommended! Full bodied and nutty. Enjoyed each cup! holy moly! This one is so good. Solid cup of coffee. Very chocolaty. Brewed immersion, tried it hot and iced. There's a nice cherry flavor when cold. Maybe a little darker than my ideal but I would think that this would be a crowd pleaser. ETA: The packaging from Klatch is terrible the "reseal" sticker is useless after a day or two. This coffee was delicious and brewed super well, the bloom was amazing. It was very smooth and easy to drink. Its a simple coffee and is delicious throughout the cup. The only reason I didn't rate it a 5 was because I genuinely prefer fruity coffees and there was not a lot of complexity in the cup. Overall, it was a great coffee and I would highly recommend it. Beans and ground were too dry. Flavor rather flat. Do not find it rich at all. Not sure about roasting techniques, but I'm thinking I like an oilier roast. More flavor and complexity. This was the best coffee I had so far. Very nice finish. But still seems a bit mild in my opinion. The first burst of flavor seems bland and missing something. Again the finish was nice. It is okay. I did not enjoy it as much as the first two. As fantastic as my first coffee was, this one was even better. I definitely enjoyed the roast level and was amazed at how chocolaty both the aroma and taste were. I can get a hint of a bit more of a burnt flavor than the previous coffee, but the full flavor really compensates. It was very bold and smooth. This coffee was good. Compared to the others so far I would say I like the first selection the best. It's very enjoyable. Nutty and chocolate notes come through, but it isn't too powerful. Like this a lot. Nice and balanced with nutty flavor. Think this would be a good "everyday" coffee. Enjoying this coffee a lot! Great anytime drinker.... Thank you! Thin bodied. Weird nutty flavor that lingered all day giving me a nasty taste in my mouth. Reminded me of cardboard. Rich, but light and not too bitter. I really like this coffee! A comforting, "any time of the day" cup. Balanced body, nutty. Medium acidity. In fact, everything about this coffee is medium. I liked it very much but I prefer the bolder tastes of the Aponte (1st coffee). Roast level is good--a little darker would be fine. Excellent flavor--dark chocolate and nutty. I would drink the Aponte in the morning and the Colombia Supremo in the afternoon. Really enjoy drinking this coffee. Original taste, easy to drink. Just a good cup of coffee. Nothing spectacular, but just hits the spot. It's smooth and relaxing, and has been a delight so far. Colombia Supremo normally works for me, but this time it was not as good as the previous one (forgot the name). I enjoyed this coffee in my aeropress. It didn't blow me away, but I thought it was a good cup. Good flavor. Very smooth, clean finish. Not very flavorful. Kind of boring.